La Belle is an elegant, warm, romantic and feminine super yacht for women by Monaco-based designer Lidia Bersani. La Belle is a study in opulence with Swarovski crystal chandeliers, floral glass mosaics, mother of pearl and golden taps – you could mistake the bathroom for a jewellery store. The plans include tailor-made fabrics embroidered and studded with gemstones, cream and white coloured marble and onyx used along with bespoke wooden furniture. 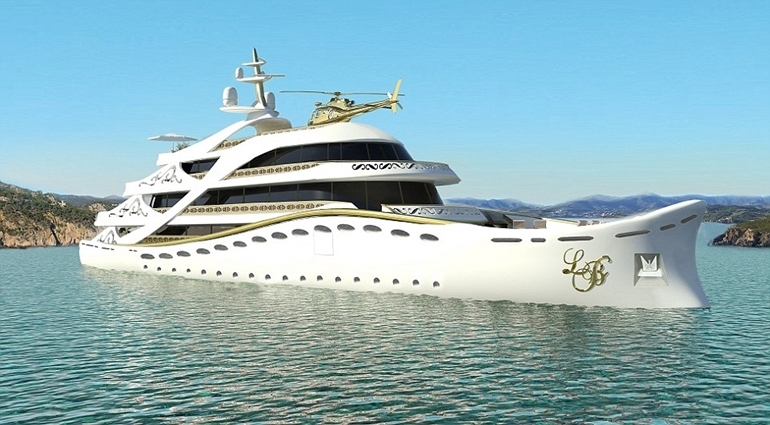 La Belle is the ‘first luxury mega yacht designed for a lady’. 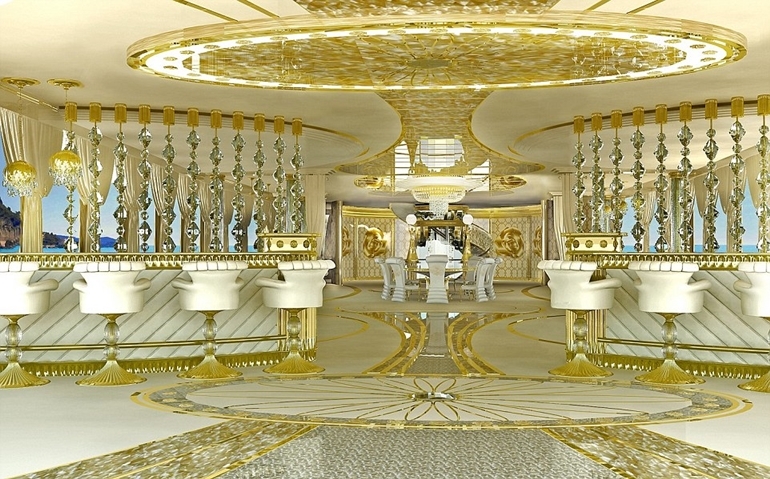 Designed in five decks, this luxury yacht is not for the faint hearted. Report also added that Targeted at female buyers, designer Lidia Bersani’s creation is a riot of opulent gold mosaics, mother of pearl, Swarovski crystal chandeliers, gemstones, onyx and bespoke wooden furniture. The vessel’s six deluxe cabins can comfortably sleep 12 guests. And the master cabin on the second deck comprises a round king-size double bed, private terrace, among others. On the 5 decks are located five more guest suits, a few lounges and dining places, facilities for live music, spa area with hydro-massage pool, sauna, hammam, infrared sauna, snow room, ice fountains ,etc, and a small fitness club with outdoor Jacuzzi, library with fire-place, beauty center, disco club, and of course a cinema – Theater and a few bars too. Each deck has a very nice outside area for relaxing, tanning, observing and just spending time. This Mega Yacht is also equipped with ultra-modern stabilizing system and state of the art machinery and equipment. There is also a swimming pool on the main deck with sophisticated system to cover it and save water. For the comfort a glass, round and chic lift, and stairs around it, both finished by Crystals, and gold. If you and a few friends fancy a break or perhaps a hen do needs organising, the liner can comfortably sleep 12 guests in six sumptuous cabins. Outside, guests can lounge on one of the decks and soak up the sun around the main swimming pool. If taking the impressive staircase is too strenuous, there’s also a lift. And the crowning glory? What else but a helicopter landing pad. The luxurious vessel is still at the planning stages, so a price tag is up for negotiation, according to the customer’s requirements.